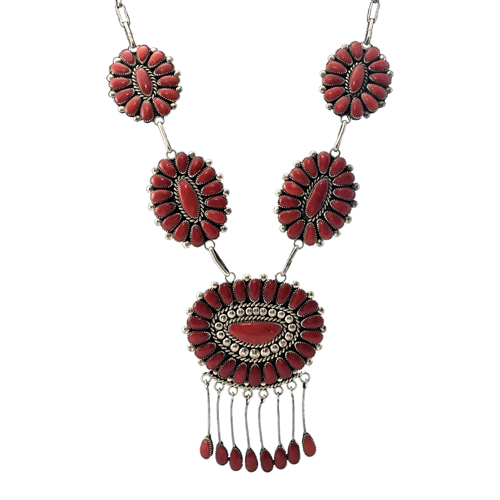 Renewed national interest in Native American history and art in the 1970s brought new energy and prosperity to Southwestern jewelry making.Not only did the market expand to accommodate more makers, but the heightened interest in Native culture also fostered conditions that allowed the best smiths to elevate their craft into a truly indigenous art form. Such groundbreaking artists as Charles Loloma, Kenneth Begay, and Preston Monongye combined sophisticated aesthetics with unparalleled technical ability to create world-class designs that have reestablished the prominence of Native jewelry making in America. Alan Penketewa - Navajo Turquoise and Silver Pendant , c. 1960, 1.25" x 0.75"
George Kee - Navajo White Hogan Sterling Silver Choker, c. 1970s, 14"
Hopi Silver Overlay Pendant with Kokopelli Design c. 1960, 1.75" x 1.25"
Kenneth Begay - White Hogan Ironwood and Sterling Silver Neck Tie Pendant, c. 1950s-60s, 5.5"
Large Navajo Turquoise, Coral and Silver Pendant c. 1960, 4.75" x 4.75"
Navajo 3-Strand Silver Beaded Necklace with Turquoise and Silver Naja Pendant, c. 1960s, 30"
Navajo Coral and Clam Shell Heishi Necklace, c. 1900-20, 25"
Navajo Italian Drumcut Coral Necklace with Hachita Turquoise Tabs, c. 1940s, 32"
Navajo Number 8 Turquoise and Silver Pendant c. 1950-70, 1.375" x 1"
Navajo Sandcast Silver Cross Pendant, c. 1960s, 3.75" x 2.125"
Navajo Silver and Serpentine Pendant, c. 1950, 1.75" X 1.375"
Navajo Silver Beaded Necklace, c. 1940s, 23"
Navajo Turquoise and Heishi Necklace c. 1960s, 25.5"
Navajo Turquoise and Heishi Necklace with Silver Beads, c. 1920s, 22.25"